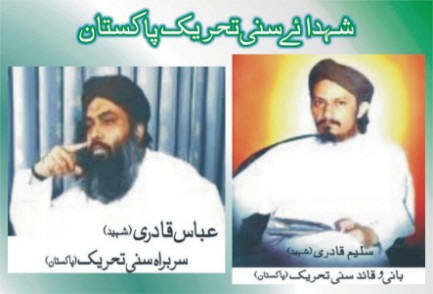 Sunni Tehreek was established by late Muhammad Saleem Qadri in Karachi, Pakistan in 1990 to safeguard and promote the interests of Barelvi movement in the clashes against the rivals Deobandi and Ahle Ahadith movements during that time . 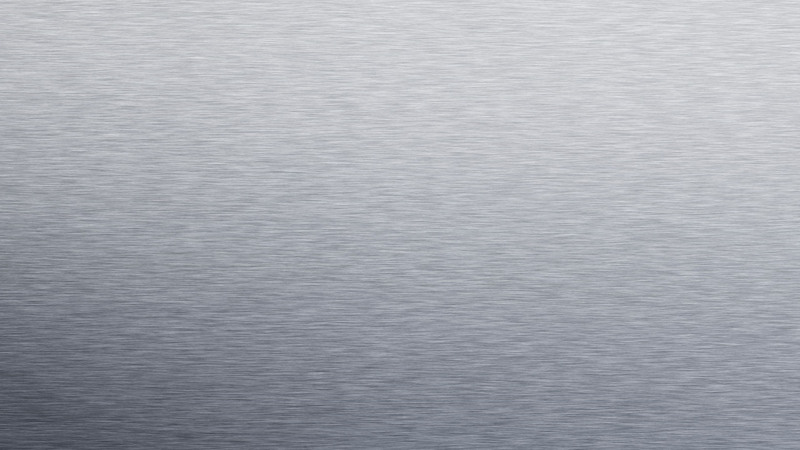 In short, it was formed to safeguard the rights of Barelvis subsiding in the area. With the passage of time, the outfit lost most of its central leaders as a result of violent encounters with opposition groups (mainly Muttahida Qaumi Movement, MQM), leading to the downfall of the outfit. In 2009, the current chief of the group, Muhammad Sarwat Aijaz Qadri reinvented the outfit with a new name “Pakistan Sunni Tehreek”. Pakistan Sunni Tehreek is also believed to be the political wing of the once “Sunni Tehreek”. Ex Leader of Dawat-e-Islami, Saleem Qadri broke away from his previous organization and formed the new outfit “Sunni Tehreek” in 1990. Muhammad Saleem Qadri was the founder of the outfit and remained the president of the outfit until his death in 1998 by unknown gunmen . No other information is available. Ejaz Qadri is the current leader and president of Pakistan Sunni Tehreek. He is an active leader and with the help of media, he is continuing the mission of Sunni Tehreek . No more information is available. Barelvi is a branch of Sunni Islam and has more than 200 million followers throughout South Asia. The name Barelvi actually comes from the north Indian town of Bareilly, the hometown of its founder and main leader Ahmed Raza Khan (1856–1921). Barelvi movement is to a great extent influenced by Sufism and the traditional folk Islam practices of South Asia. Barelvi Sunni oppose the Deboandi Sunni and consider themselves as the real followers of Sunni Islam and the teachings of prophet Muhammad (PBUH). Sunni Tehreek is funded by Barkati Foundation . No information is available about Barkati Foundation. according to news Sunni Tehreek is under watchlist (2007)*. Recruitment sources of the organization are unknown, but they have a student wing Pakistan Islamic Student Wings Federation which is popular in schools and colleges of Karachi, so it is assumed that the student wing plays a role in the recruitment . Promotion of interests of Barelvi . Linkages http://www.islamicacademy.org/html/Articles/English/Tableeghee%20Jma%27at-Ahadis.htm , http://www.nooremadinah.net/Documents/Misc/TheDeviantSHIASect/TheDeviantSHIASect.asp , are some links which have been spreading distorted facts about Wahabis and Shias and these links have a connection with the militant organization Sunni Tehreek. Sunni Tehreek is a militant organization which is considered to be anti Shia . The organization focuses on safeguarding the rights of Barelvis from Deobandis and Ahle Hadith. It has been involved in militant activities as according to a news report, members of Sunni Tehreek killed one person and injured three when they tried to enter and take over the Jamia Masjid Ahle Hadith . The organization also has a student wing Pakistan Islamic Students Federation which is quite active. Sunni Tehreek was created in 1990 by the late Muhammad Saleem Qadri in order to promote inter of Deoband and Ahle Hadith. Since its formation Sunni Tehreek has made many attempts to take over Ahle Hadith and Deobandi mosques by force in Karachi, which has resulted in violent retaliation from extremist Deobandi groups . The founder of Sunni Tehreek Muhammad Saleem Qadri was assassinated in 1998 . The message of the organization is to promote Barelvi school of thought and counter Deoband school of thought and their outfits. Sunni Tehreek also has a rivalry with the MQM. The organization focuses on people with a Barelvi school of thought. They concentrate on the youth as they have their own student wing Pakistan Islamic Students Wing Federation. 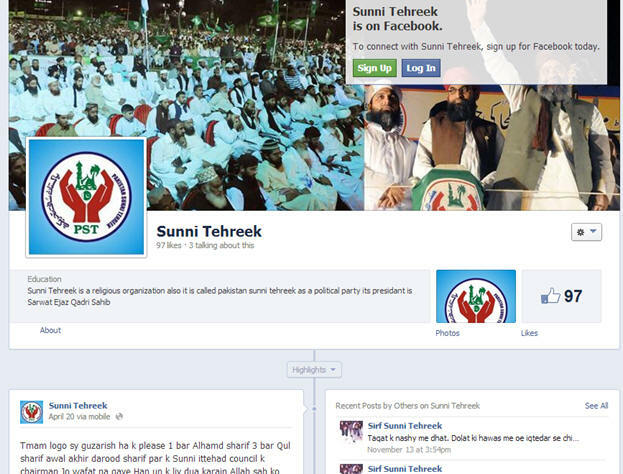 Sunni Tehreek uses social media like facebook and twitter to disseminate their agenda. They also have blogs. 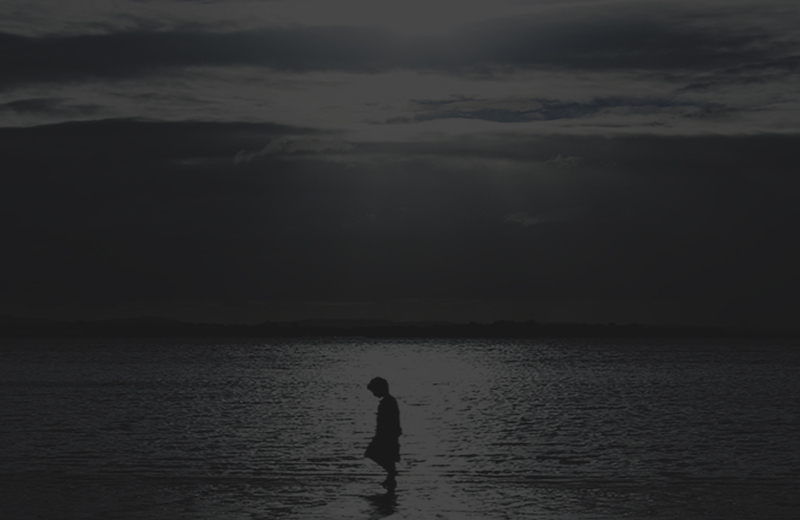 The websites like sunnitehreek.com and sunnitehreek.com.pk have been proscribed. This is Sunni Tehreek’s main page with 97 likes and some people have also given their comments on this page. To view complete details of the tools being used by Sunni Tehreek click here. Olivier Roy and Antoine Sfeir, The Columbia World Dictionary of Islamism, pg. 275. Colombia University Press, 2007.